To understand the spatial relationships of the different cardiac chambers, three basic rules of cardiac anatomy should be remembered. First, because of the orientation of the cardiac long axis, the ventricles are more or less to the left of their corresponding atrial chambers. Second, the right atrium and the right ventricle are relatively anterior to their left counterparts. Third, because of the anterior position of the chambers of the right heart, the aorta and its valve have a central position in the heart, being wedged between the atrio-ventricular valves and posterior to the infundibulum of the right ventricle. The aortic valve is, therefore, related to all four cardiac chambers. across the crest of the atrial appendage, thus sitting on the junction of crest and SVC in a horseshoe manner (Anderson etal., 1979). Because of its immediately subepicardial position, the node is particularly vulnerable to surgical trauma. The considerable variability found in the vascular supply to the node (Figure 2.19), together with the lesser variability in nodal position, compounds the vulnerability of the entire junction of the SVC with the right atrium during cardiac surgery. The nature of the right and interatrial myocardium, and its relationship to interatrial conduction, has been a controversial subject. Some authors have suggested that specialized tracts of conduction tissue extend through the walls of the right atrium and the atrial septum to connect the sinus node with the atrio-ventricular node. We have searched diligently for such tracts by serially sectioning the entire atrial chambers of infant hearts in a single block of tissue. Our results show that the tissue connecting the nodes is the plain atrial myocardium of the right atrial walls and the interatrial septum. There are no tracts of conduction tissue that are insulated from the myocardium in a manner comparable with that of the ventricular conduction pathways (Anderson et al, 1981). The geometrical configuration of the right atrium is such that its walls are divided into bands of muscular tissue by the venous orifices and the fossa ovalis. This atrial morphology more than adequately accounts for the routes of preferential conduction found in electrophysiological mapping. In our opinion, histologically specialized tracts do not exist between the nodes. 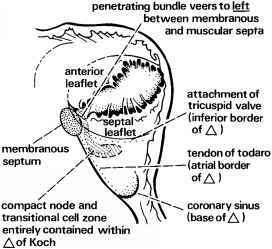 The atrio-ventricular node, together with its transitional cell zones, is contained entirely within the triangle of Koch (Anderson and Ho, 2001; see Figure 2.16). If all incisions and procedures avoid this triangle, damage cannot be inflicted on the node except in the rare circumstances in which atrio-ventricular conduction occurs through an aberrant conduction system (see Chapter 8). The node, located within the interatrial septum, penetrates into the central fibrous body to become the penetrating atrio-ventricular bundle at the apex of the triangle. 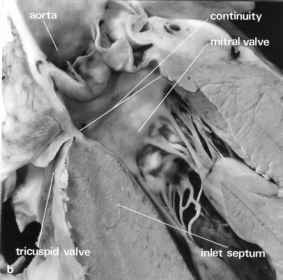 The bundle passes from the right atrial tissues into the left ventricular outflow tract on the ventricular aspect of the point of insertion of the tendon of Todaro into the central fibrous body. 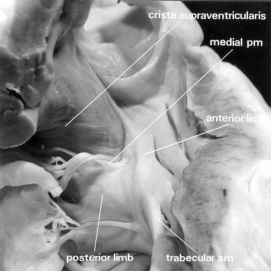 The detailed anatomy of the penetrating bundle and the ventricular conduction tissues are described in the sections devoted to the atrio-ventricular junction and the left ventricular outflow tract. roof of the left atrium receives a pulmonary vein at each of its four corners. Running inferiorly beneath the posterior surface, and occupying the left inferior aspect of the atrio-ventricular junction, is the coronary sinus, which drains to the right atrium. When a left SVC is present, it usually drains to the coronary sinus, extending downward between the left atrial appendage and the left pulmonary veins. 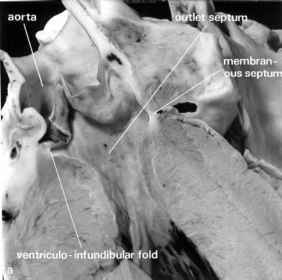 More usually, the left SVC is not present, being represented by its vestige, the oblique vein of the left atrium, itself related to a fold of pericardium in the oblique sinus. Surgical access to the left atrium is usually obtained either through the atrial septum, in which case its confines must be remembered (Figure 2.17), or through the left atrium between the interatrial groove and right pulmonary veins. A discrete furrow exists between the entrance of the right pulmonary veins and the SVC. This furrow, known as Waterston's or Sondergaard's groove, forms the greater part of the superior rim of the fossa ovalis. 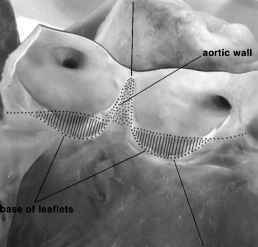 It is no more than an infolding of the atrial roof and, if necessary, can be dissected to produce additional atrial tissue, as, for example, for use in the Senning procedure. 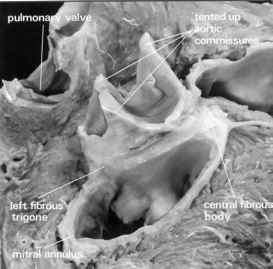 The atrial roof itself is extensive between the entrances of the right and left pulmonary veins. 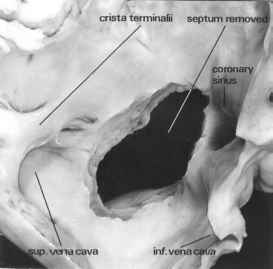 Having opened the left atrium through an incision in either the septum or the roof, the surgeon is confronted with the vestibule of the mitral valve in the floor of the atrium, and with the much smaller orifice to the appendage on the left. The septal surface of the left atrium is not visible. 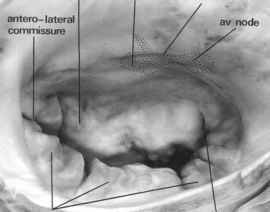 When seen in isolation, the characteristic roughened aspect is, in reality, part of the anterior wall rather than the septum and overlies the transverse sinus. It is not the left atrial counterpart of the fossa ovalis. junction. This latter junction is the circle over which the fibrous wall of the arterial trunk is supported by the respective ventricle. 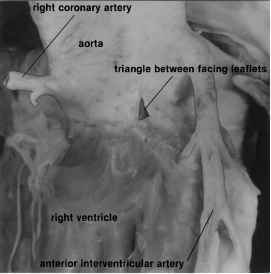 As a consequence of this arrangement, three triangles of arterial wall, thinner than the adjacent walls of the arterial sinuses, are incorporated within the structure of the ventricular outflow tracts, and three scallops of ventricle are incorporated at the base of each arterial sinus (Figures 2.22 and 2.23). 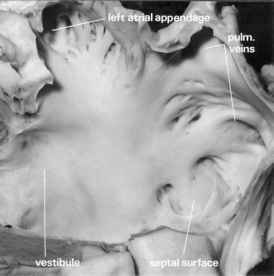 It follows from this complex geometrical arrangement that there is no collagenous ring, or annulus, supporting the semilunar leaflets of the arterial valves in any sense comparable with the way in which the leaflets of the atrio-ventricular valves are attached in a circular manner at the atrio-ventricular junction. 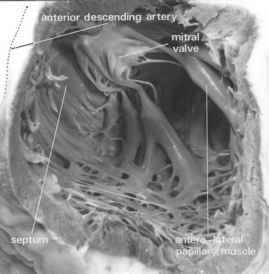 The only ringlike structure at the ventriculo-arterial junction is the line of fusion of the fibrous arterial wall with the supporting ventricle, viz. 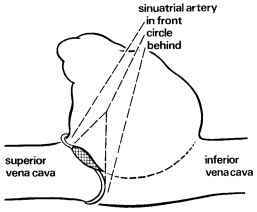 the anatomical ventriculo-arterial junction (Anderson, 2000). It is the crown-like configuration of the attachments of the leaflets, nonetheless, that is referred to by surgeons as the ''annulus''. but this is of minimal dimensions in the normal heart (Figure 2.30) and cannot be identified with certainty without resorting to dissection. 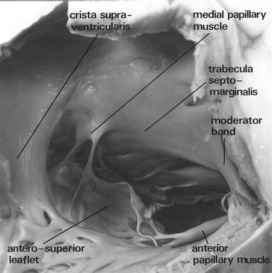 This anatomical structure, however, is of considerable importance with regard to controversies concerning the nature and description of the supraventricular crest. 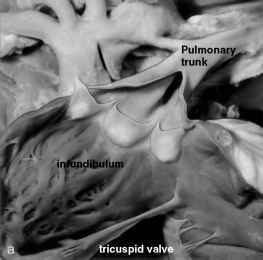 The crest in the normal heart is the extensive muscular structure that separates the attachments of the leaflets of the tricuspid and pulmonary valves in the roof of the right ventricle (Figure 2.27). Some authors categorize the trabecula septomarginalis (sm in Figure 2.30) as the ''septal band'' of the normal crest, but the trabeculation is purely a septal structure, and is in no way ''supraventricular''. The crest itself has two distinct components that are discrete structures only in malformed hearts. 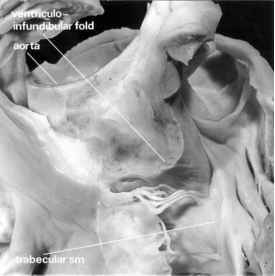 The larger part, the ventriculo-infundibular fold, represents the inner curvature of the heart wall (Figure 2.30). Incisions through this part take the surgeon outside the heart. Only a very small part of the crest, the muscular outlet septum, is located between the subpulmonary and subaortic outflow tracts. 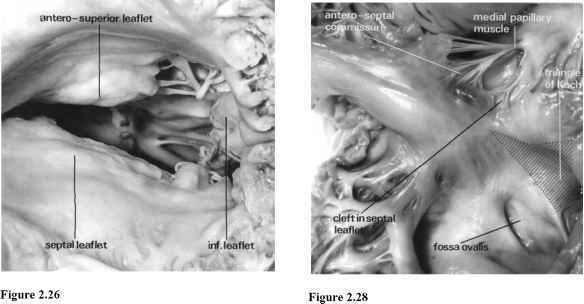 without disturbing the musculature of the left ventricle (Merrick et al., 2000). 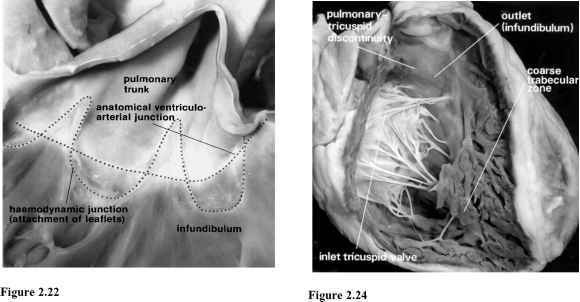 This has important consequences concerning the morphology of the ventricular septum (to be described). 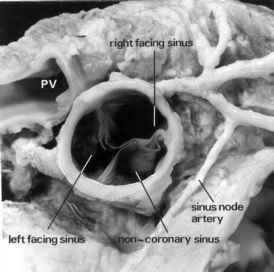 When the sinuses of the pulmonary trunk, and the leaflets of the pulmonary valve that they contain, are named and described, advantage can be taken of the fact that two sinuses of the pulmonary trunk almost always ''face'' the sinuses of the aorta that give rise to the coronary arteries. These sinuses can, therefore, be termed the right and left facing sinuses. The zone of apposition between the leaflets that they support is almost always opposite the zone of apposition between the corresponding facing leaflets of the aortic valve. The other leaflet of the pulmonary valve is thereby described as the non-facing leaflet, and is supported by the non-facing sinus. 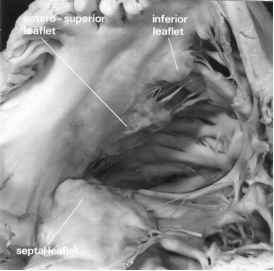 ventricular junction to the attachment of the papillary muscles, and contains the mitral valve. This valve has two major leaflets, separated by the solitary zone of apposition between them, and is supported by paired papillary muscle groups (Kanani and Anderson, 2003). Although usually described as being ''anterolateral'' and ''posteromedial'', in reality they are positioned anteroseptally and posterolaterally. Surgeons usually gain access to the mitral valve through the left atrium behind the interatrial groove, via the right atrium and the atrial septum, or superiorly through the left atrial roof. When seen through any of these approaches, the aortic, or anterior, leaflet is superior and to the right of the mural, or posterior, leaflet (Figure 2.33). The aortic leaflet, so-called because it is in fibrous continuity with the leaflets of the aortic valve, occupies only one-third of the circumference of the mitral orifice, but the leaflet is much deeper than the mural one, so that the area occupied by the leaflets is about the same. The mural leaflet is usually divided into a series of mini-leaflets, or scallops, by marked slits. Three scallops are usually seen, along with two further components adjacent to the ends of the zone of apposition between the leaflets. The inferoseptal end of the zone of apposition, along with its so-called commissural leaflet, abuts against the atrial septum. 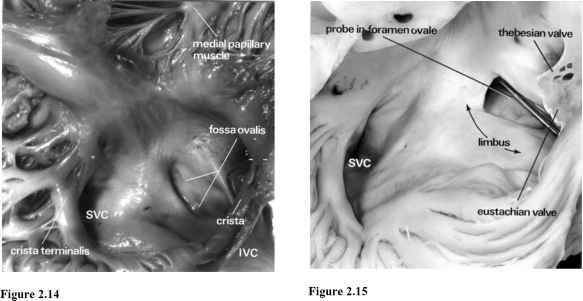 This is the area of the valve most vulnerable to surgical trauma because the atrio-ventricular (av in Figure 2.33) node and bundle occupy the septum at this point. The attachment of the valve laterally may be closely related to the left coronary artery, a feature that is discussed in the section on the atrio-ventricular junction. The apical trabecular zone extends from the attachments of the papillary muscles, which are adjacent when the heart is unopened, to the ventricular apex. The trabeculations are characteristically fine, and a moderator band is not found. 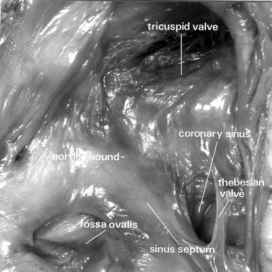 The outflow tract of the ventricle extends from the apical trabecular component to the attachments of the leaflets of the aortic valve. The margins between the apical trabecular and outlet portions are indistinct. leaflets. 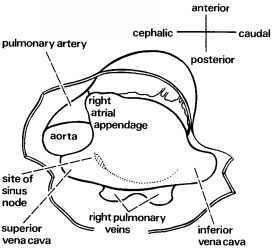 The apex of the zone of apposition between the facing, or coronary, leaflets of the aortic valve is also related to the outside of the heart, specifically to an extensive tissue plane separating the front of the aorta from the back of the pulmonary trunk (Figure 2.39). 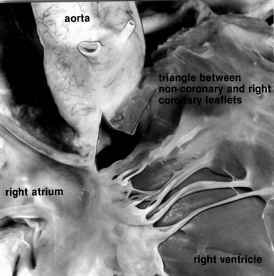 The extent of this interleaflet triangle is best seen anatomically after the subpulmonary infundibulum is removed from the right ventricle. How how many chambers are there in heart. what is their haemodynamic relationship? Why is the internal surface of the cardiac chamber rough?